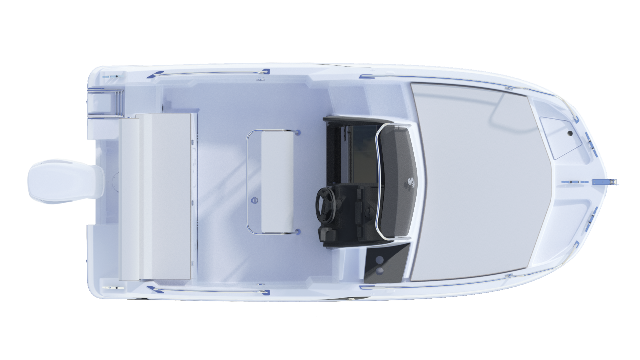 Smallest of the dayboat range alongside the SPACEdeck version, the Flyer 5.5 SUNdeck has everything a bigger boat would offer. Her driving console is similar to that of the Flyer 6.6 and she carries up to 6 people on board. Comfort on board is remarkable for this size of boat. 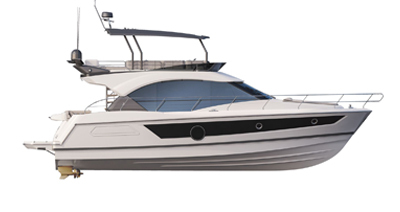 The Flyer 5.5 SUNdeck has an incisive sporty silhouette, emphasised by the profiled lateral struts, and elegant windshield design and the brown line signature mark common to all the Flyer SUNdecks. Taking advantage of the unusual amount of beam on deck, it offers two driver seats, one large aft bench seat and sundeck sheltering a fore cabin. Very narrow at the bow, her special V-shaped hull deflects water perfectly. The Flyer 5.5 SUNdeck optimises all the resources of a particularly spacious deck. She boasts a very spacious forward cabin for this size of boat. This is ideal for storage! Her hull performance and the variety of equipment available make her a surprising dayboat. By converting the aft bench into a second sun lounger, this creates an additional sunbathing area to the good-sized one located to the bow of the boat. The driving console with two bolster seats (available on option) provides good protection and is similar to that of the Flyer 6.6. 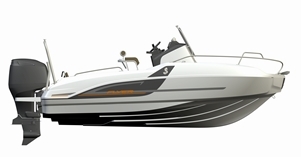 Developed in close partnership with Suzuki, the Flyer 5.5 is compatible with up to 140 HP engine power. She has a 135 litre fuel tank (36 US GAL). CE Certification C6 - D6 - maximum 6 passengers on board. Driving console similar to that of the Flyer 6.6. Single outboard engine - maximum power 140 HP - Holiday pack Suzuki engine.